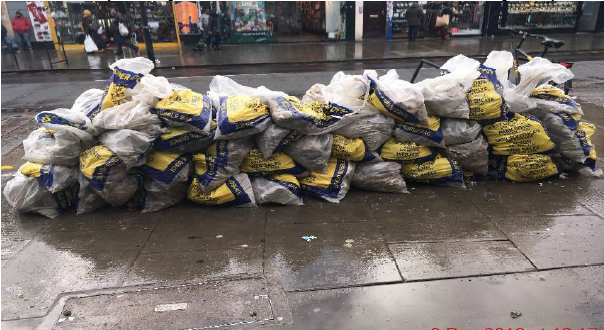 Unlicensed street trading, fly-tipping and an illegal sale of a knife to an underage buyer are just a few of the crimes that have resulted in over £16,000 of fines being issued by Haringey Council this winter. Our two-month Operation Christmas Cracker – carried out between November and December – focused around hot-spot areas in the borough where anti-social behaviour and unlawful activities are carried out. Haringey Council’s enforcement officers in partnership with officers from the Partnership Police Team and Safer Neighbourhood Teams, Immigration and neighbouring boroughs, worked around the clock in Wood Green High Road, White Hart Lane market, Tottenham market and West Green Road to take action against anyone committing an offence. The hard work paid off as penalty notices amounting to £16,151 were issued and there are more to follow in the coming weeks. The main offences included unlicensed perfume sellers, businesses unlawfully depositing waste, a fly-tipping landlord and a notice served on a supermarket for a serious mouse infestation. One delivery driver had a day to forget after picking up THREE penalty fines inside the space of half an hour. Officers also used the time to engage with people sleeping roughalong Stroud Green Road, ensuring they were aware of how to access support. Leaflets were also handed out to members of the public with information on how Haringey and Islington are working to help those sleeping rough. “This operation has been a major success and our message is loud and clear. We will take the strongest action against anyone who carries out unlawful activity in the borough.